Bruno Fernando screams after a basket scored against Indiana. COLLEGE PARK, Md. 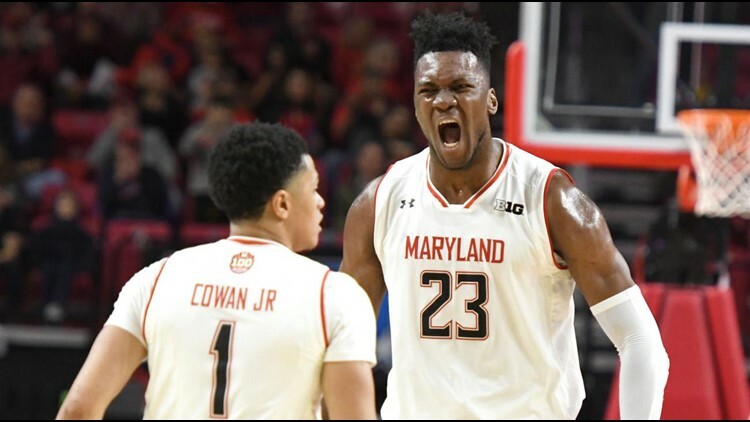 — Maryland men’s basketball stars Bruno Fernando and Anthony Cowan, Jr. intend to declare for early entry into the 2019 NBA Draft, according to statement released by University of Maryland Athletics. Fernando – a 6-foot-10 sophomore – averaged 13.6 points and a team-high 10.6 rebounds per game this past season. He would be the first Angolan-born player in NBA history. Cowan, meanwhile, averaged a team-high 15.6 points per game in 2018-19. He also led the Terrapins in minutes per game, three-pointers, free throws, assists and steals. The 6-foot junior guard was named in the starting five in all 99 of his Maryland appearances. New rules adopted by the NCAA allow college players to sign with agents while determining whether or not they will officially enter the NBA Draft, according to Maryland Athletics. If a player opts to return to school, they retain eligibility as long as they cease the relationship with their agent. The NBA combine takes place between May 14 and 19 with the draft occurring on June 20. If either Fernando or Cowan chooses to return to Maryland, they will have to announce their decision by the May 29 NCAA withdrawal deadline. The Terrapins finished the 2018-19 season with a 23-11 record and placed fifth in the Big Ten. They were a No. 6-seed in the NCAA Tournament and were eliminated by No. 3-seed LSU in the second round. Before Fernando and Cowan declared for the draft, ESPN, CBS Sports and NBC Sports ranked Maryland at No. 9 in their early 2019-20 men’s basketball rankings. The Athletic had the Terrapins at No. 8. If Fernando and Cowan leave, Maryland would have to find a way to fill the void left by its two top scorers from this past season. The Terrapins would presumably lean on former five-star recruit Jalen Smith, who averaged 11.7 points and 6.8 rebounds per game in his freshman season, and a recruiting class headlined by 6-foot-9 twins Makhi and Makhel Mitchell.